Springtime in Seattle’s Pike Place Market means tasty foods and wide-eyed tourists, and Pepper’s Spice Shop is ready for the crowds. With flavorful combinations and a fresh approach, she’s sure to win over the public. Even better, she’s working with several local restaurants as their chief herb and spice supplier. Business is cooking, until one of Pepper’s potential clients, a young chef named Tamara Langston, is found dead, her life extinguished by the dangerously hot ghost chili—a spice Pepper carries in her shop. 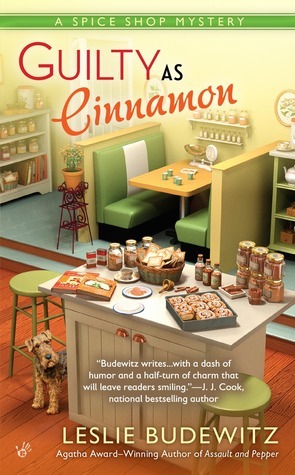 I really enjoyed this second installment in the Spice Shop Mystery series. It is fun reading about the different spices as well as the recipes in the back of the book. Then we have the mystery. I have wanted to visit Seattle and this book makes me want to find a market as like the one in this story. The charcters are fun and it is exciting to go along with Pepper as she tries to find out who killed the young chef. Now my dad likes ghost pepper so for this to be the murder weapon was kind of ironic. It was fun trying to put the clues together to see if I could figure it out before Pepper but like normal I was not able to. I think that is why I like cozy - I was never good at logic puzzles - so I have a hard time with the clues sometimes but I like that in the end we are always told who did it. I am looking forward to the next book in this series. 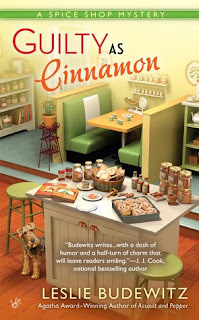 National bestselling author Leslie Budewitz writes the Spice Shop Mysteries and the Food Lovers’ Village Mysteries. She fell in love with Seattle’s Pike Place Market as a college student, and still misses prowling its streets and alleys, sniffing out tasty treats and sensory delights. Leslie won the 2013 Agatha Award for Best First Novel for Death al Dente, first in the Food Lovers’ Village Mysteries, and won the 2011 Agatha Award for Best Nonfiction for Books, Crooks & Counselors: How to Write Accurately About Criminal Law and Courtroom Procedure. She loves to cook, eat, hike, travel, garden, and paint—not necessarily in that order. She lives in northwest Montana with her husband, Don Beans, a doctor of natural medicine, and their Burmese cat, Ruff, an avid bird-watcher. So glad you enjoyed taking the trip to Seattle with me!